During his college years Wertel held internships at Carpenter Braun and the Metalsmith May Studios. He then started to work as a freelance designer before becoming the design project manager of Studio X Ross Lovegrove for nearly two years between 2004 and 2006. In 2006, together with Gernot Oberfell, they founded the Wertel Oberfell platform in London which works in a wide range of areas including furniture, lighting, industrial product design as well as experimental research pieces. 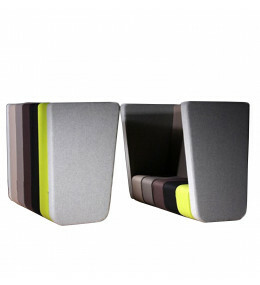 Dilim Seating for office breakout and waiting areas. Colourful modules endlessly connect. Dilim Modular Highback Seating for agile working in open plan offices, privacy and informal meetings.